+ Incorporate and align important educational standards into the district's education plan. + Set district-wide goals and use curriculum collaboration groups to define and share curriculum with teachers across the district. + Provide students and parents with online access to course information and educational standards. + Standardize curriculum across all schools in the district and ensure that the curriculum is aligned with state and district standards. + Provide teachers with a guide to what, when, and how to teach lessons and give assessments so students achieve their maximum potential. + Teachers and students know early on what is expected of them, and parents can see their child’s overall future curriculum. + Allow teachers to easily integrate standards right into lessons. 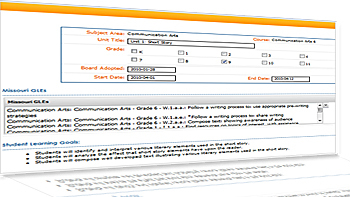 + Allow teachers to share and reuse course information, lesson plans, unit maps, objectives, and activities. + Give educators complete control over curriculum and ultimately publish the information onto a web site. 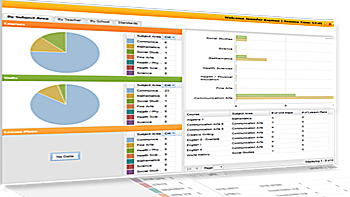 A Customized Approach to Curriculum Management: Webinar looking at how curriculum structures are different across school districts, and addressing how a district can use a curriculum management system that molds to the district's existing format and structure. Curriculum Management from a Principal's Perspective: Taking a look at curriculum management, then vs. now, and see how eCurriculum has changed the face of district wide curriculum management for the better. Educators, students, and parents are all benefiting from this new and imporved method of curriculum management. Visit our corporate website for more webinars and presentations. View units by start date. See an entire quarter at a glance. 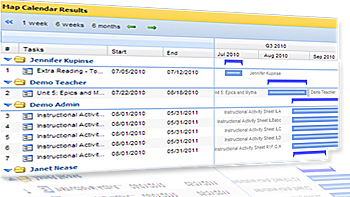 Manage lesson plans, unit maps, and schedules. 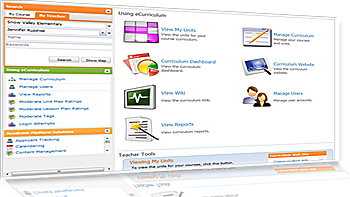 View curriculum by subject area, teacher, or school. View state and district standards. Align curriculum to state and district standards. Share maps and curriculum with others.